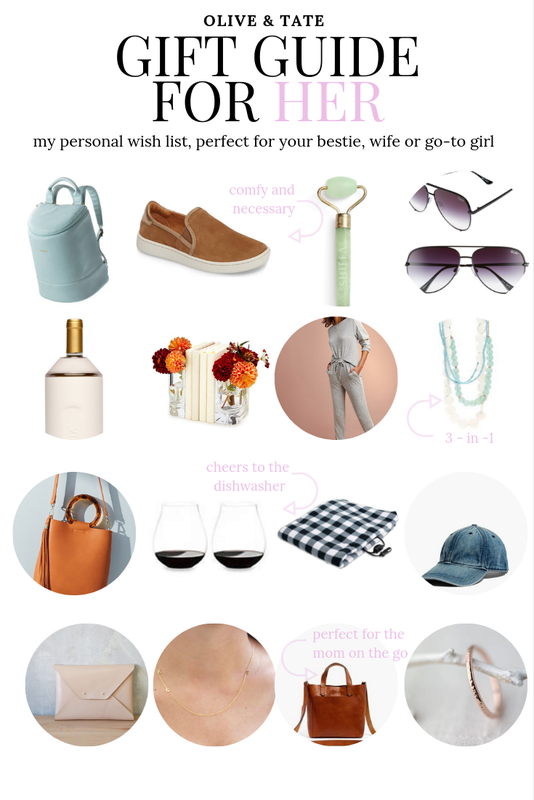 Let's call a spade a spade, my friends, this little round up is absolutely my personal wish list, but as I'm always one to consider others, I thought it might be the perfect way for you to drop a hint or two to the Santa in your life. Forward this post right along to your husband, partner, mom, co-worker or bestie and you'll be a happy girl come Christmas morning! And in case you're worried, I still covered all retailers (and those known for fast shipping because: husbands), price points and stages of life so I know the perfect gift for you is on this list. Let's get to it! Yep, I absolutely do think I need a wine backpack in my life. It's insulated, can hold 2 wine bottles + 8 cans, comes in three colors and has padded shoulders to help handle the load. I'm so here for it. Spotted these on a fellow preschool mom at soccer practice the other day and had to have them. They're made by a brand known for comfort and my friend assured me they are crazy durable, she's been rocking hers for a year and they looked great. Perfect to wear with jeans or leggings, this is the kind of shoe I need in my life. I'm not sure what this Jade Roller is really supposed to do except make my under eyes less baggy and my jowls less saggy so I'm probably going to need two. This is my fave brand of sunglasses mostly do to the price point - they tend to all be oversized and I love the two pair that I currently own. This is an aviator style that I don't have and I think they'd make the perfect stocking stuffer. Yep, another wine accessory. Hey, I am who I am. This particular wine chiller promises to keep all wine or champagne the perfectly chilled temp for hours thanks to its vacuum-insulated, stainless steel canister. Plus, it's pretty. I really love the style of this set of bookends, which also serve as a flower vase. Bringing greenery or a pop of color into my styled bookshelf makes me happy, so this little set should keep me pleased for days on end. I consider this a step up from my velour Juicy track suit days, but I'm always going to be a fan of a full body outfit that is meant to induce laziness. Bring on the sweatsuit! I actually already own this necklace but wanted to put it on the list because it would make a great gift from the husband. It is a little pricey but each strand of beads can be worn alone or paired up to make an endless variety of looks. The brand also happens to be made here in Charlotte by a pair of sisters so I love supporting the home town girls. I love this price point for a bag with a unique detail (that might not always be in style). It comes in a ton of colors - I actually love the army green - and can hold a good amount of crap without feeling like a total mom bag. I think I need it. Yes, they're called Big O glasses, mostly because of the joy you get when you toss them (gently) into the dishwasher and don't have to bother with hand washing. Technically a Syrah glass, the bowl of these babies is large and ready for a generous pour. I do sometimes feel bad for my kids that I have heated seats and they have to freeze in their car seats as the car warms up, but not bad enough to skip whipping out a heated blanket powered by the cigarette lighter in my car. Most of my baseball caps are stolen from my husband so I'm thinking he'll get me this little number just to reclaim all of his Clemson gear. Confession: I love an envelope clutch. I think they're so elegant and timeless. This version is a gorgeous blush color and oversized, so I know it will fit my giant phone and like the entire bottle of Advil I require if I'm planning to stay up past 10pm. I love the delicate look of this sweet initial necklace. This happens to be a dupe for a very expensive style and I think it looks just as gorgeous. This tote bag has been on my Wish List for years, I don't know why it never ends up under the tree! It can also be monogrammed for a personal touch (hint husbands, monogram it) and has both the crossbody and shoulder straps for easy transitions. I just happen to love the look of this super thin, hammered gold ring. It's available in a few other metals but I think it would be amazing on my right hand pointer finger or stacked with a few of it's friends on my right ring finger.